Blueberries are beginning to ripen in the fields on the farm next door. This recipe is a good way to use up the berries in your freezer or to enjoy the fresh ones that come your way. In a large bowl, put the yeast and sugar and add the warm water. Let stand about 10 minutes. In another small bowl, stir together the butter, salt, potato flakes and the hot water. Let this sit while the yeast proofs. Add egg to the butter and potato mixture, then add to the yeast. Add 1 cup of flour at a time stirring well. Continue to add enough flour to make a soft dough. Knead until the dough is smooth. Put the dough into a greased bowl and let rise covered until double, about an hour. Line 2 9X13 pans with Parchment paper. Divide the crumble mixture between the two pans. When the dough has finished rising roll it out to a rectangle 20 X 10. 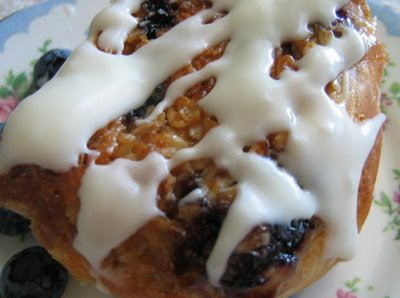 Spread a bit of butter on the dough and sprinkle with blueberries. I didn't measure how many blueberries, but I likely used about 2 - 3 cups. Roll up jelly roll style and mark the dough into 24 pieces and cut with a sharp serrated knife. Lay the rolls on top of your crumble. Cover and let rise again about an hour or until nice and puffy and double. Combine to make an icing that can be drizzled. Bake on a lower but not the lowest rack to make sure the crumble gets nice and brown. Flip the buns out so that the crumble is on top. Oh my..this looks fantastic, Lovella. I had forgotten about these, my Mom used to make them..it always was such a treat. I will be making these in the near future. Great photos..looks like I should be able to grab one right off the page! Oh, my these look so yummy. 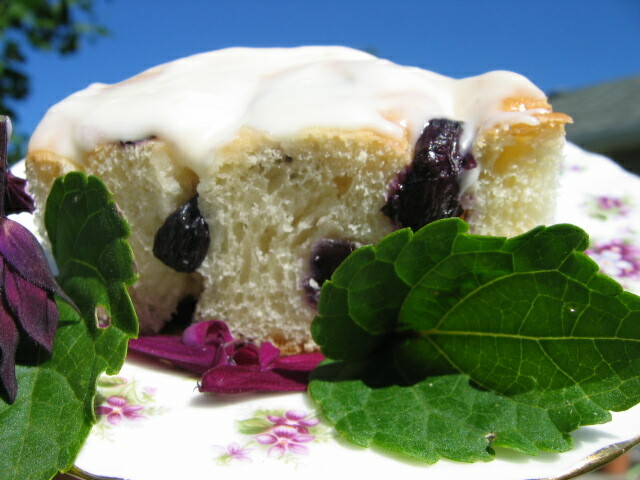 I think I will have to make those on a rainy day and make a blueberry crumble instead with ice-cream today. You sold me when I noticed the "crumble" part. I've never had on like this and I have to smile that someone else likes to guess how a coffee shop made something and try it out. Your pictures are amazing too! I am new to this web page but i think it looks wonderful... the pictures and the diffrent recipes are wonderful for my up comming wedding!! I'm thinking I will be trying these later this morning. I don't have a Convection oven...guessing I can use the temp my cinnamon rolls bake at. My mouth is watering for the taste of blueberries. These were delicious. My teenage son really likes the addition of blueberries. (I actually used saskatoons.) I will be making these again.